Electronics Archives | Solved That! The very first page of this site was devoted to the dreaded “Preparing Your Tv” message on my Samsung Smart tv. Despite solving the “Preparing Your TV Samsung” error message I still found the so called “Smart TV” to be a lousy experience. Enough is enough my time is to valuable to waste waiting for a tv. Since writing the original post there has been a few changes around the house. By changes I mean purchasing a Roku 4 and a 65″ LG 4 UHD TV. This means I now have the ability to compare the Samsung Smart TV to the LG Web OS, Roku 4 as well as my trusty Amazon Fire TV. Ill save the actual comparison of those four for another day. For the purpose of this page and your sanity I will simplify and get to the bottom line. 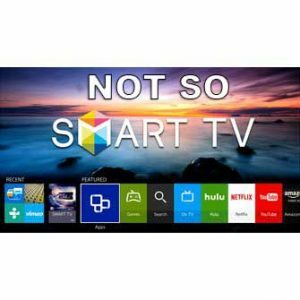 Do yourself a favor and forget about using the built in Samsung “Smarts” and buy either an Amazon Fire TV or a ROKU 3 or 4 depending on your needs. Both devices simply just work. I have a personal preference for the Amazon Fire Tv. The unit is small, powerful and the menu structure makes sense especially if you are an Amazon prime customer or like to buy your streaming movies from Amazon. The thing that really seals the deal is the voice search. I love the Amazon Fire TV. On the other hand if your a Netflix junkie the Roku might suit you better as no single app is prominently in your face like the Fire Tv. Both devices simply and elegantly get the job done. One more compelling reason to go with the 3rd party streaming device is support. TV operating systems quickly become outdated and unsupported by the manufacturer. folks like amazon, Roku and even Apple will provide updates much longer and much more reliably. Moving in to a new home that lacks cable tv RG6 in the walls means I have my work cut out for me running cable. Unfortunately though the little woman can’t wait. It would appear she can’t sleep without tv playing in the background. I decided a small Samsung smart TV was needed and the Samsung Smart TV model UN24H4500AFXZA with it’s built in WiFi seemed like an easy choice. Upon powering up the TV I was greeted by a setup wizard and upon completion the tv notified me of a firmware update. I let the tv do its thing and reboot.first thing I did was head straight for the apps from Amazon and HBO Go. I was greeted with a message “Preparing your tv” and “try again later”. Immediately I had that feeling, you know the one “Here we go I’m about to lose hours of my life figuring this out”. As is always the case I am not the first person to face this. I followed much of the online advice or turning the tv on and off and resetting it. Nothing worked. After a bit of time and reading “Preparing your tv” one too many times I decided to walk away for a minute. Upon my return I tried the Samsung Amazon app and the app worked. That got me thinking and what I determined is that there is nothing wrong with the tv it just takes a long time to acquire everything it needs from the internet before the apps are usable. Unfortunately this is not a good realization. Knowing enough to be dangerous I decided to look at the internet settings. Immediately something stood out and that was the DNS Servers. 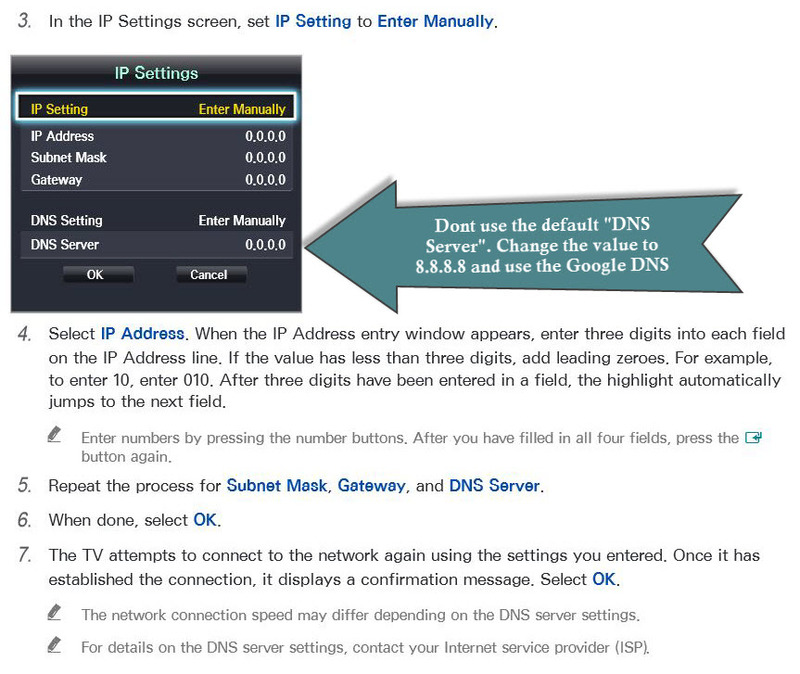 I changed it from whatever the tv had acquired on its own to the google DNS server of 8.8.8.8. I rebooted the tv. The improvement was was remarkable. While the apps are not instantly available they are available in about 30 seconds (be patient as your location might take longer). See my screenshot below of the DNS setting, try it for yourself and say goodbye to the dreaded “Preparing your tv” message. You may also download the Samsung Smart TV Manual 2016 in it’s entirety. There you go we SOLVED THAT!